Very rare early view of Moscow. Moscou Capitale de la Moscovie Suivant Olearius. A scarce and finely engraved 1719 view and map of Moscow, Russia by Pieter van der Aa. Oriented to the west, this remarkable view illustrates all of Moscow as it appeared at the end of the 17th century. It gives the impression of a bustling and yet supremely fortifiece city. The conjunction of the Moskva and Neglinnaya Rivers form a natural moat around the Kremlin complex. Canals form additional moats around ever larger curtain walls. The whole is drawn on an axonometric projection wherein individual buildings are rendered in profile and clearly identifiable. The most important of these are further identified numerically or alphanumerically and correspond to a table to he left of the main map. At the base of the map there are a series of decorative views illustrating Russian hunters and farmers. A decorative cartouche, bearing the Russian janiform eagle armorial crest, appears in the upper right quadrant. The view itself is based upon the 1633 studies of Abraham Olearius, who in his capacity as the Germany embassy to Moscow and Persia, traveled extensively throughout Russia. 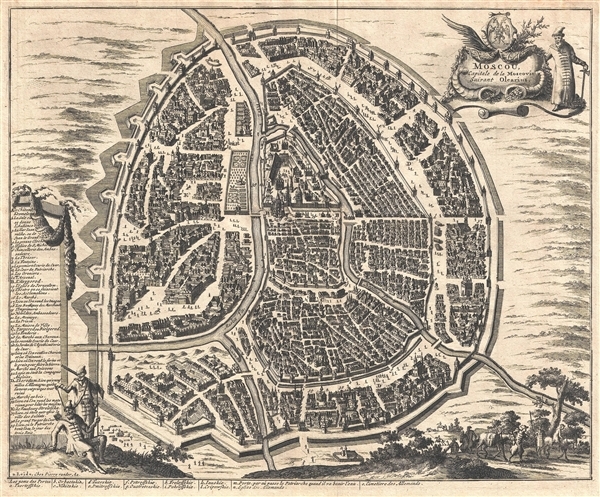 This view was engraved in Leiden by Pieter (Pierre) van der Aa for inclusion in Olearius' Voyages tres-curieux et tres-renommez faits en Moscovie, Tartarie et Perse. Olaerius, A, Voyages tres-curieux et tres-renommez faits en Moscovie, Tartarie et Perse, (Leiden: van der Aa) 1719. Very good. Light overall toning. Original pressmark visible. Blank on verso.